(Seattle,WA) – Pike Brewing Hive Five is now available year-round in eye-catching 12 oz. cans. With a surprisingly dry and crisp flavor and a slight clover like essence of honey at the finish, Pike Hive Five is springtime in a glass. This light and flavorful hopped honey ale comes to cans just in time for beer lovers to take along on picnics, hikes and long days on the water. Pike Hive Five is brewed with superb local honey from the Salish Lodge & Spa’s bees, which adds dimension to the biscuity flavor of wholesome malt and aromatic Yakima Valley hops. Pike Hive Five pours a light golden color and pairs well with salads, seafood, nuts and cheeses. 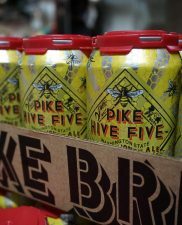 Pike Hive Five won the gold at the Washington Brewer’s Festival during its limited seasonal release in 2016. Salish Lodge & Spa has 120,000 honey bees that live in their apiary above Snoqualmie Falls. Pike Hive Five is the second beer from Pike Brewing Company to be canned, following Pike Space Needle Golden IPA. It is available now at retailers around the greater Puget Sound area and at The Pike Pub. MALT VARIETIES: Organic Pale, Organic Pils, Munich, Malted Wheat, Carapils, Flaked Oats and honey from the Salish Lodge & Spa’s bees. 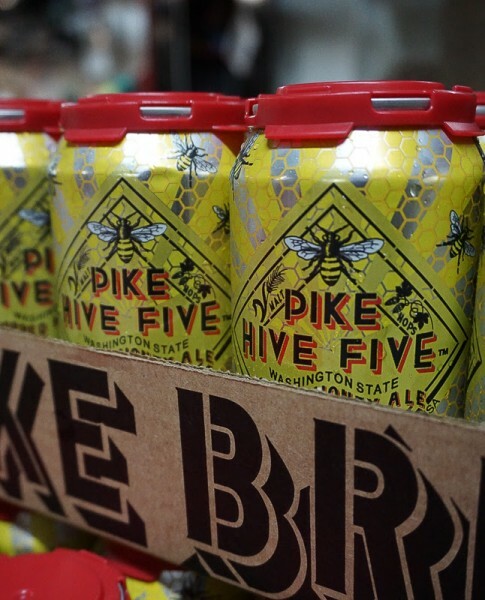 Pike Hive Five is available now at Puget Sound area retailers and at The Pike Pub. This is the second can from Pike Brewing Company, following Pike Space Needle Golden IPA. The Pike Brewing Company is a family owned brewery located in the historic Pike Place Public Market neighborhood. It was founded in 1989 by craft beer pioneers, Charles and Rose Ann Finkel. Pike Brewing handcrafts beers of character including the Pike Pale Ale, Pike IPA, Naughty Nellie, Space Needle IPA, Kilt Lifter, Monk’s Uncle, and XXXXX Stout along with seasonal offerings such as Harlot’s Harvest, Old Bawdy, Auld Acquaintance, Derby Lager, Saison Houblon, and Octopus Ink. The Pike Pub is known for local, sustainable and seasonal pub fare and for housing the world-famous Micro-Brewery Museum, illustrating 9,000 years of beer history.